From the last lesson we started to Create a New 3D Building. Now we need to plan how big we want it. Watch the video on YouTube and / or read about it below. This tutorial is all information about how big to make things (contains no required steps for the ongoing tutorial order). The steps will continue in the next tutorial. It is not hard to create something that looks right in proportion to itself, for example a door size on a wall, windows, and ceiling height. But in order to create a 3D Community with proportional 3D Buildings we need to be aware of a Common Scale for measurement. The program is written to use Units. 1 Unit = 6 inches or 15.24 centimeters. Consider that a 3D Thing is a Group of 3D Building Blocks. is the original size it was created. This is the Blue Chair in the image below. 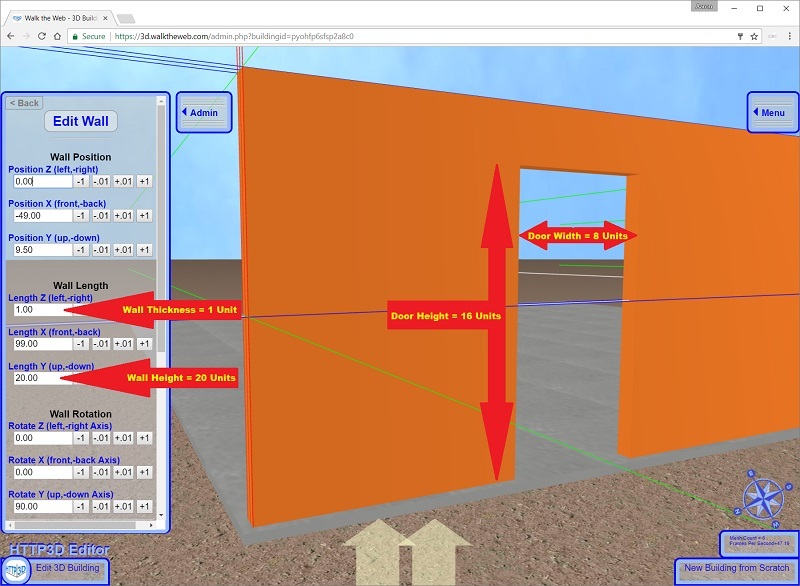 Right Click a 3D Thing to edit the position, rotation, and scaling (and other advanced settings). 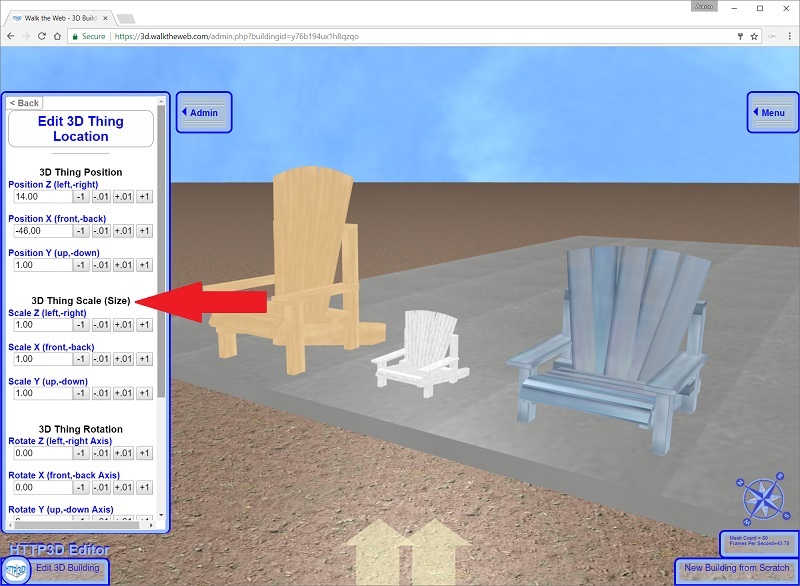 The following image demonstrates where to find the Scale Settings and shows the 1:1:1 ratio of the Blue Chair. 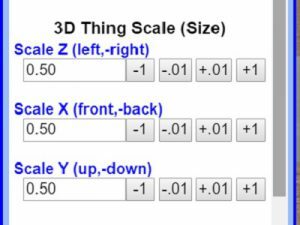 To scale a 3D Thing and keep the ratio in tact, change x, y, and z scaling to the same value. For example the White Chair is set to 50% of its original size (using .50 or half). 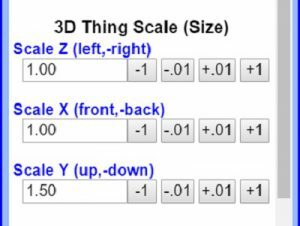 You can also scale a 3D Thing using nonproportional values. 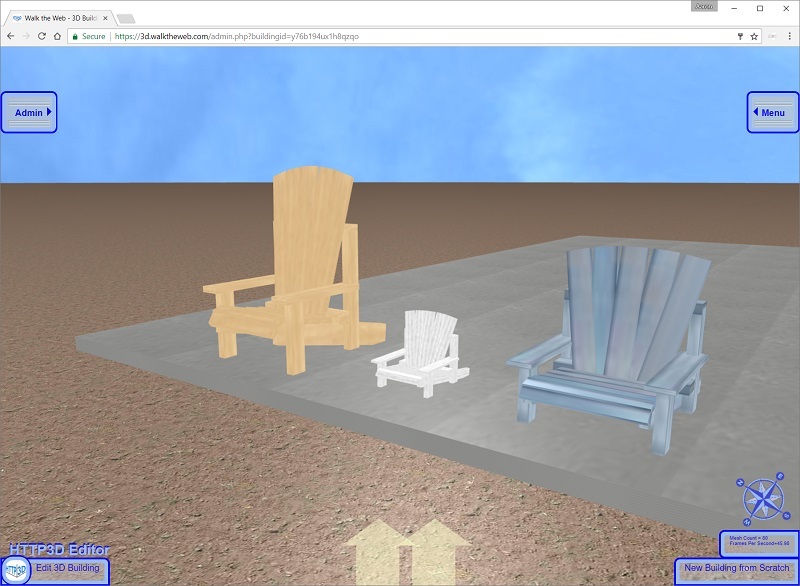 For example the Yellow Chair is 150% taller (y scale), while Z and X are the original size. 3D Buildings in a 3D Community.